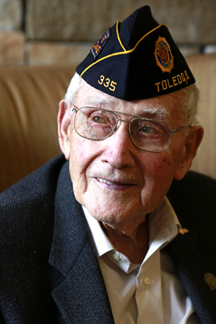 At the age of 96, Robert Edgar Barger will graduate Saturday, May 5, from The University of Toledo with an associate of technical studies degree from University College. Barger entered the military service in 1940 with the United States Navy, where he served as a commissioned naval officer, earned his naval aviator wings, and was detailed as a naval flight officer. 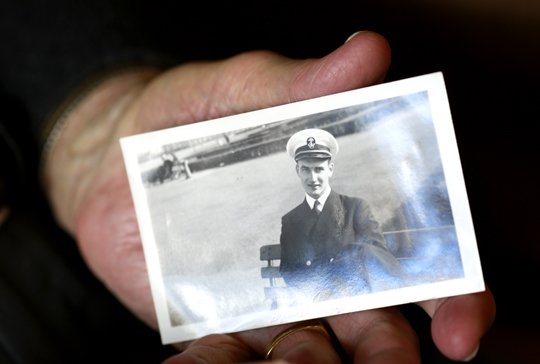 After returning from WWII, Barger attended the University, but left before finishing his degree so he could get a job to provide for his wife and two children. In 2013, Barger met Navy Reserve Lt. Haraz N. Ghanbari, UT director of military and veteran affairs, when he promoted Ghanbari to the rank of lieutenant. Ghanbari later found out that Barger had not been able to finish his degree. After reviewing Barger’s transcripts, it was determined the veteran met the requirements to graduate with an associate degree. Barger has invited 100 people from his retirement community to the commencement ceremony and plans on having a large graduation party to celebrate his achievement. World War II Navy veteran Robert Edgar Barger held a photo taken of himself Oct. 9, 1943, during his service as a naval aviator. He is believed to be the oldest UT graduate. Barger said that earning his degree is something he will be proud of for the rest of his life and is excited to accomplish something he had set out to complete many years ago. This entry was posted on Tuesday, May 1st, 2018 at 3:57 am and is filed under Events, Features, News, University College, UToday .